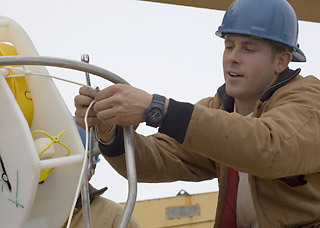 Kris will be assisting Rick with the installation of the ice-based observatory buoys. Kris has had a long career studying the oceans—he was a captain for the New England Aquarium’s marine science programs, which included whale watching and oceanography trips. Half of his WHOI cruises to date have been in the Arctic working from icebreakers. I will be assisting Rick Krishfield with the field coordination and deployment of two Ice Tethered Profilers, 2 Ice Mass Balance Buoys, and 1 Heat Flux Buoy. While Rick will be focusing on the instrumentation, my role will be the lead mooring technician - making sure all of the mechanical components of the deployment apparatus (i.e. winch, tripod, block, buoys, wire rope etc.) are functioning properly and are able to be deployed in an efficient and safe manner. Ultimately: not to screw up! Chocolate and Yogurt: both seem to keep me satisfied and perhaps even give me a little boost of energy. (A) Working at WHOI, and specifically in the Arctic, has always been about learning new trades (i.e. mechanical, electrical) and techniques to ultimately get the job done. Whether it's from an ice breaker, an ice camp, or in the tropics from another ship, the bottom line has always been about getting the instrument(s) in the water any way necessary and to be safe while doing it and (B) of course to get a sense of adventure. Who wouldn't want to travel all over the world, particularly, to the North Pole! I was born in Wolfeboro, NH and lived most of my young adult life in an adjacent town called Tuftonboro, NH.